The smile of a child is a powerful thing. I see one in Fond Verettes. The people of this small town in the hills of Haiti are living in poverty, yet they have opened their homes to some 8,000 displaced earthquake survivors. I've come here from the U.S. on a humanitarian mission, but for now, I'm also taking refuge, escaping the rain by ducking inside a food vendor's plastic tent. The smiling child and I watch a woman frying pork, chicken, breadfruit, salt-cured fish and potatoes. My 10-year-old friend tells her that blan ("foreigner," that's me) is hungry. She hands me a plate of fritters, deep-fried flour balls called marinades, and spicy pork. It's delicious. My friend is joined by other kids, and I offer them my plate. They're shy at first but soon dig in. I buy another plate; there are smiles all around. 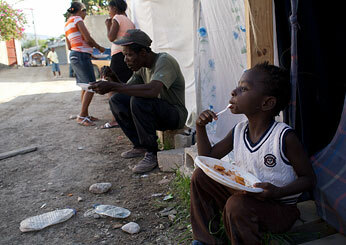 There's rain in the hills and valleys of Haiti but comfort in this food. It lifts one's spirit, just like the children. 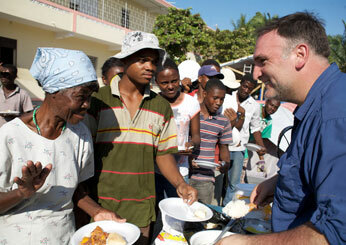 Before coming here I asked myself, How can a chef help the people of Haiti? The obvious answer: Cook them a meal. Yes, but what if I could also help them cook for themselves? So I signed on with Solar for Hope (thesolarforhope.org). 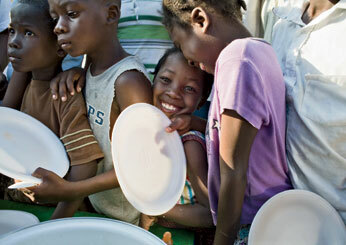 We arrived in Haiti with 14 solar kitchens to distribute. 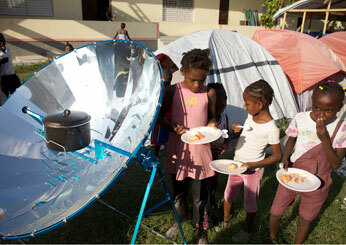 Not only can a solar-powered kitchen feed people, it can also help with Haiti's deforestation crisis, which the earthquake has only worsened. The kitchens, called parabolics, look like metal beach umbrellas; a rack in the middle holds a large pot. During my week in Haiti, I show the village women how to direct the concave panels toward the sun and harness the energy required for long, continuous heat. 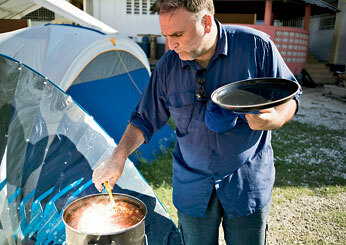 I make a decent sausage stew with rice and peas that feeds about 200 people. But more people keep coming. What can I cook for them? Bread, garlic and sardines were at the local store. I turn the bread into crumbs, coat the sardines and fry them with butter and garlic, like we do in Spain. Their hunger helps my creativity. As a chef, I have never felt so needed. 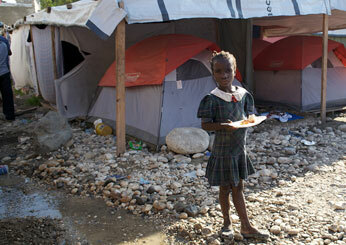 The center of Port-au-Prince is still devastated, but the city moves at a furious pace. No one waits for tomorrow. Refugee camps are everywhere, but the people are proud. 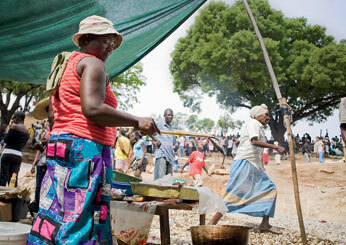 An old wood-burning oven is heaving, and bakers are working by hand, as fast as they can. I buy a few trays of bread and leave. Kids appear from nowhere, coming back from school. They stick their hands out, and I give them bread. They don't eat it; instead, they place it in their backpacks to share with their families.